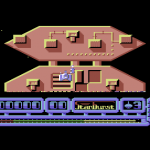 A very short entry for now regarding a game which was produced by a young Karl Hornell when he was around 14. 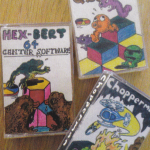 The game was Hex-Bert, and we believe was a Frogger clone done at a time when there were not many games around for the C64 in his homeland of Sweden. Karl even produced his own custom inlay and created a fantasy software house called Center Soft. This was just before getting involved with Interceptor Software. When asked about potentially adding the games to the website, Karl declined – citing that these were titles that he was not happy with and are something which should never see the light of day.